This weekend, the great and the good of the custom world are congregating at the Oak Canyon Ranch in Silverado, California, for the Born-Free show. 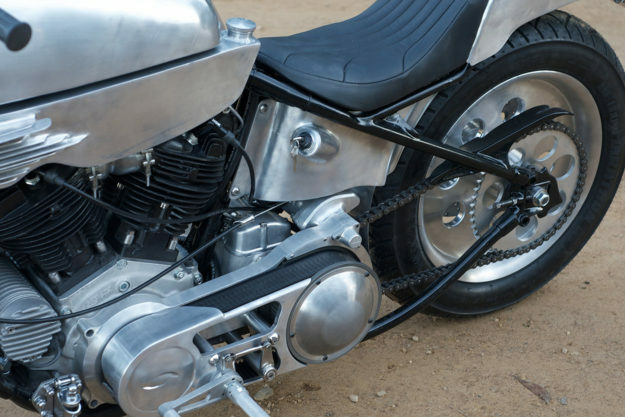 It’s probably the most prestigious of the American chopper-oriented custom shows, and if you’re an Invited Builder, it means you’re at the top of your game. Australia’s Matt Machine is no stranger to Born-Free. 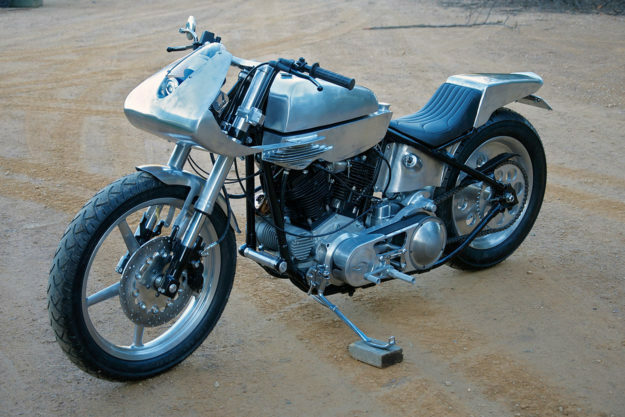 Two years ago, his Norton Atlas won the Best British trophy. Last year, he was an Invited Builder. And this year, the show organizers extended the compliment again. 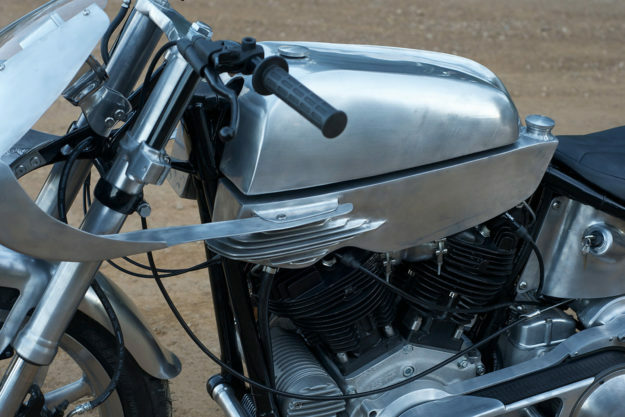 Matt’s latest bike is a sculptured metal masterpiece, with retro-futuristic curves and a delicious sheen on the hand-beaten alloy. It looked promising when we saw it on the bench in his workshop two months ago, but it looks amazing now. 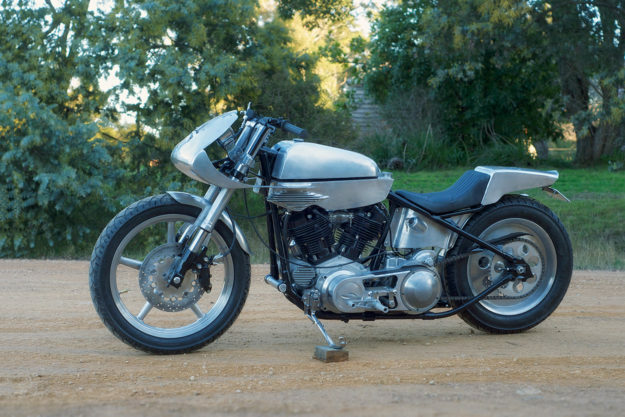 With the deadline for Born-Free looming and a motorcycle show to organize as well, Matt called in assistance from Canberra-based fabrication whiz kid Brado Miller. The two of them have put 250 hours each into this machine. 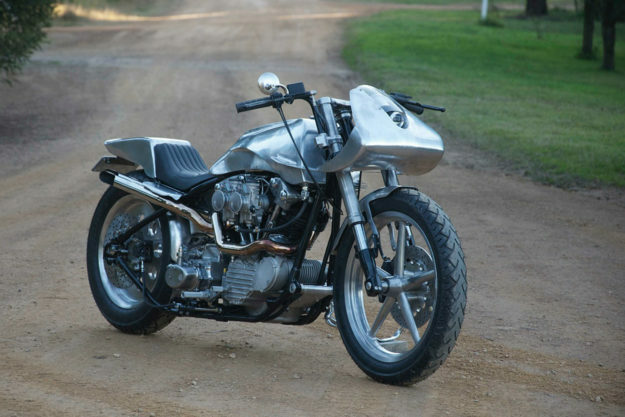 After fettling and cleaning up the hardtail frame, Matt and Brado squeezed in a freshly uncrated 93ci S&S knucklehead motor and hooked it up to a Baker 6-speed gearbox. Two 40mm Dell’Orto pumpers supply the go juice, sitting on an aluminum dual-plane manifold—which was cast to Matt’s design by the transportation hardware specialists UES International. The mechanicals are all class. The stopping gear is Italian, with Brembo brakes from a Ducati 999, a front master cylinder from a Moto Guzzi, and a rear from a Ducati Monster. Kawasaki ZXR upside-down forks are mated to polished custom triples. 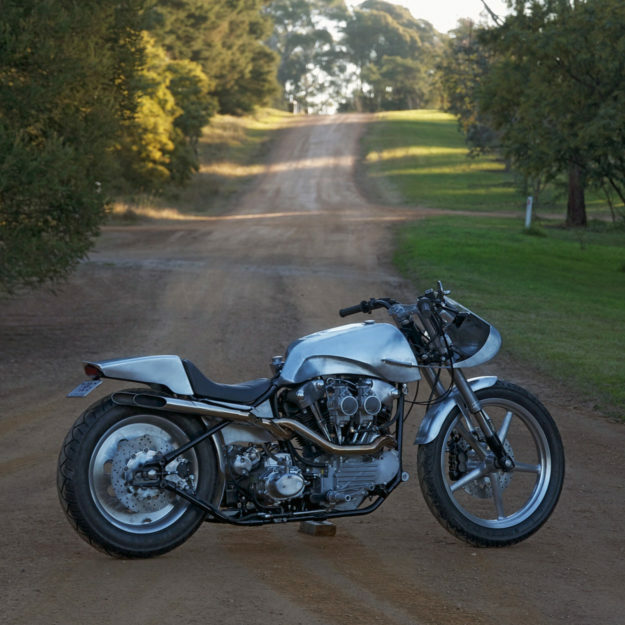 A new BDL belt drive transmits the power to a custom rear wheel from Dragway in Victoria, Australia, and the spoked front wheel is from a Harley Softail Rocker. 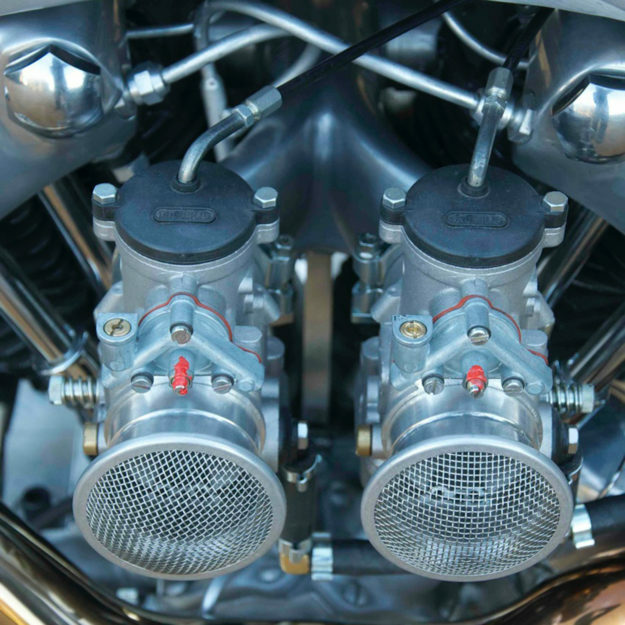 The foot controls are modified Tarozzi items, the speedo is a Drag Specialties electronic unit, and the throttle is a Tommaselli twin pull—as would normally be fitted to an older Moto Guzzi or Ducati. 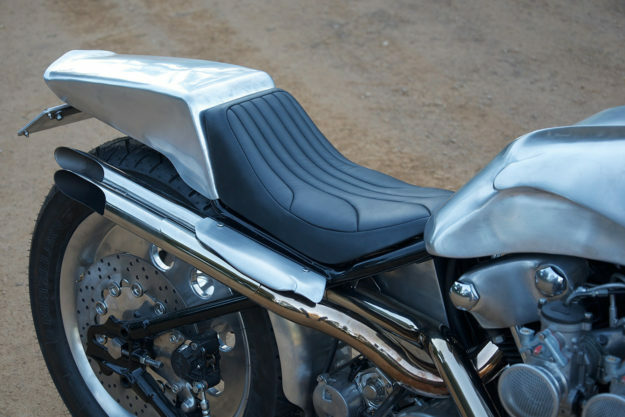 But the real star of the show is the fabrication, from the soft sheen of the fairing, tank and tail unit—blocked back to a satin finish with multiple grades of Scotch-Brite—to the subtle gold glow of the stainless exhaust system. After the electrics went in, hooked up to custom switchgear from Purpose Built Moto, the last job was to finish the wooden crate to protect the bike in transit. But Matt didn’t even get to check how the bike rides. It was finished only hours before he loaded it onto the truck to drive to the airport, so he couldn’t put gas in the tank before it went on the plane. We were lucky to get a few shots, snapped at the last minute before the bike was driven to Sydney airport. If you’re lucky enough to be at Born-Free this weekend, keep an eye out for Matt and Brado, and say hi from us.